The 25th anniversary this year of Blue Mountain Vineyards & Cellars is an important milestone in Okanagan wine growing. The 2013 reserve wines just released by the winery should be part of that celebration. Blue Mountain made its first vintage in 1991. The winery was established near Okanagan Falls by veteran grower Ian Mavety and his wife, Jane. 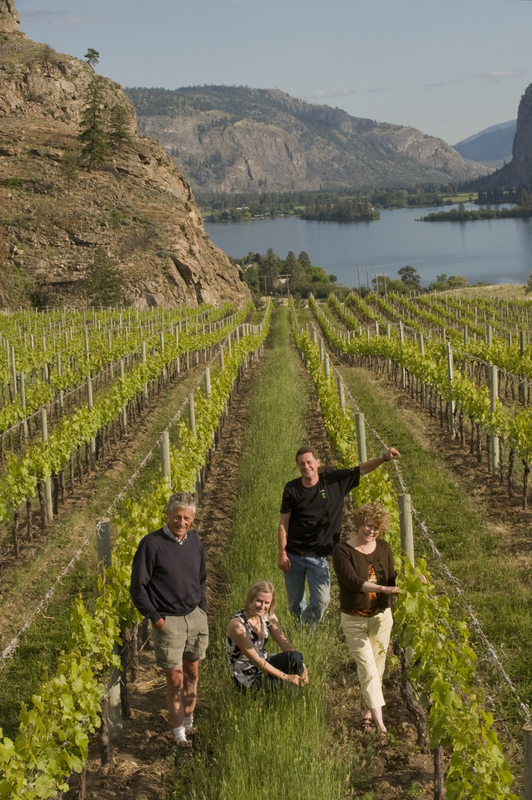 Since then, it has consistently produced some of the Okanagan's most sophisticated table wines and sparkling wines. Born in Vancouver in 1948, Ian Mavety prepared to be a farmer with a university degree in agriculture. In 1971, in partnership with a friend, he bought a rundown fruit farm 10 minutes south of Okanagan Falls, gradually converting the hay meadows and derelict cherry orchards to the hybrid grape varieties then planted widely in the Okanagan. They were not ideal wine varieties, but the grape growers of the day prospered. “Maréchal Foch financed this property,” Ian once quipped. “Jane and I actually packed our bags and went to Europe,” Ian once told me. There they discovered a taste for dry wines. They were out of step with their peers back home who were planting German white varieties and making sweet wines. Ian and Jane preferred the wines of Burgundy and, figuring their terroir was Burgundian, imported the appropriate Burgundy varieties from France. They went to California for a consulting winemaker, hiring Rafael Brisbois, a French-trained specialist in sparkling wine. Later, their son, Matt, studied winemaking in New Zealand and took over the cellar. However, they continued to tap Rafael for his advice until he died a few years ago. Blue Mountain’s vineyard, about 31.5 hectares (78 acres) in size, was developed with a tight focus around Pinot Noir and its relatives. “Pinot Gris, Pinot Blanc, and Pinot Noir all come from the very same parent,” Ian noted. “Chardonnay comes from a different parent but basically requires the same conditions.” Gamay, also a grape of Burgundy, was planted to give the winery a second red. Sauvignon Blanc, which thrives next to Burgundy in Sancerre, was added in the 2007 vineyard extension. The anchor in the vineyard has always been Pinot Noir, with six different clones grown for table wine and two more for sparkling wine. “I planted it because I was told I couldn’t grow it,” Ian, whose stubborn independence is legendary, once told me. “I’m serious. I was told by a German winemaker that I couldn’t grow it. But I knew that I liked the wine and that I couldn’t afford it, so it was going to have to be made.” Clonal diversity in the vineyard gives Ian and Matt more options when blending in the cellar. The winemaking style is as focussed as the viticulture. “The key,” Matt says, “is making wines that are suitable for food, that can be consumed without being heavy, because there is balance between the acid and the fruit — and the flavours are there.” The reserve wines, which are the best cellar selections and get the longest barrel and bottle aging. It is worth noting that, since daughter Christie Mavety joined the winery, Blue Mountain has been able to open its tasting room throughout the wine touring season. It is no longer necessary to make an appointment (except out of season). Blue Mountain Reserve Chardonnay 2013 ($30). Half of this wine was fermented and aged in stainless steel. The other half was fermented and aged 10 months in French oak barrels (from new to three years old). The result is an wine with appealing aromas and flavours of citrus and apple, set delicately against hints of oak. The supple texture gives the wine great elegance. 92. Blue Mountain Reserve Pinot Gris 2013 ($28). This was fermented and aged 70% in stainless steel and 30% in French oak for six months. The style recalls a slightly austere Alsace Pinot Gris. The wine begins with aromas of citrus, anise and toasty lees. The texture is concentrated with a spine of minerality (the grapes are from 26-year-old vines). The wine benefits from decanting to unlock the fruit. 90. Blue Mountain Reserve Pinot Noir 2013 ($40). The wine combines five clones of Pinot Noir from vines ranging in age from seven to 29 years. It was fermented entirely with wild yeast. The wine begins with appealing aromas of cherry mingled with toasty oak; these are echoed on the complex palate and on the spicy finish. The texture is elegantly silky. 93.